Do you normally struggle with pain in your jaw? If so, then you may be wondering what causes that pain. Some types of pain are easy to diagnose, such as pain following direct trauma to the jaw itself. However, those times are usually relatively rare. 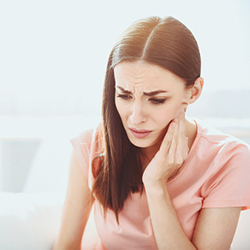 It normally takes a little testing to figure out what the root cause of your jaw pain is. Here are a couple places we can start looking to figure out the cause. Maybe one of them will be the cause of what ails you. If your TMJ makes noise when you open and close your mouth, you could struggle with TMD. Your TMJ is the joint between your bottom jaw and your skull. If this joint gets inflamed, it leads to TMD, which is a temporomandibular disorder. These are treatable, but it may take a little time to figure out what the best course of treatment is for you. If you wake up with a sore jaw, your cause could be bruxism. This is when you clench your teeth together or grind them together. Typically, people do this in their sleep and do not even realize that they do it. It takes them waking up with a sore jaw pretty regularly for them to realize that they do it often enough to get seen for it. Do you want to figure out the root cause of your pain? If so, we can help. Call our office and schedule a consultation. Let us know that you have jaw pain and about how often you have it. Keep track of anything you believe could be connected to your jaw pain from now until your appointment. That way, you can talk to us about it when you are here.